Highway 20 at Spring Hill Drive, a little after 5 p.m. on March 30. See that long line of traffic on the other side of the signal, heading into Albany on Highway 20? The traffic jam extended a long way to the west, and it’s a common thing now on most afternoons. 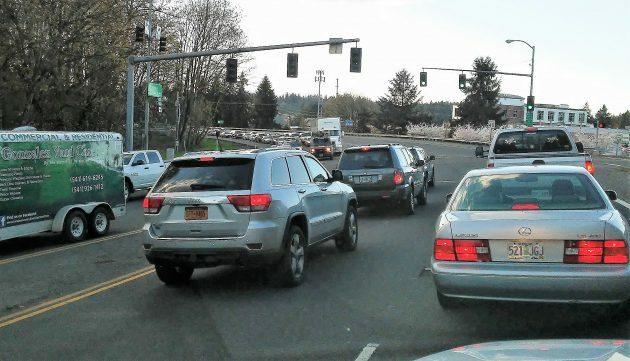 There is no easy solution — other than less traffic — but ODOT might help by making adjustments to the signals downtown. Our highway pattern was laid down more than half a century ago. The Lyon Street bridge, completing the Highway 20 couplet in downtown Albany, was built in the early 1970s. And peak-hour traffic has far outgrown what the system can handle without sometimes lengthy delays. One answer would be to shift business hours and job schedules so that everybody would not be commuting at more or less the same time. But who wants to get up at 4 a.m. every weekday to get to work by 5 or 6 so they can sign out again at 1 or 2? Another answer is to build another Willamette River bridge to bypass the bottleneck that downtown Albany represents. But when Albany officials wanted to start planning for that solution — hopelessly expensive and far in the future though it would have been — they were shot down by an idiotic state rule that allowed the city to consider no traffic solution outside its urban growth boundary. That leaves us with trying to get traffic to flow more easily as best we can. One way is to upgrade the signals on the downtown couplet at First, Second, and Third avenues to be variable depending on the flow of traffic. Cross traffic would have to wait even longer than it does now, but it’s not nearly as heavy as the traffic on the highway. And finally, ODOT should overcome its objections to the two-lane approach to the Highway 20 signal on Spring Hill Drive, which worked so well during the North Albany Road reconstruction but had to be undone because ODOT didn’t like it. The two-lane approach would allow more Spring Hill traffic to get through even when its green light is shortened to lessen the slowdown on 20 itself. I’ve done all my in-town errands in the past few days by bicycle, including a donation trip to Teen Challenge where I pulled a trailer. If people would make 10% of their trips on a bike, much of what you describe would be instantly solved. Well Ron aren’t you just the best! No, I’m certainly not the best. I just ride my bike whenever I can. Sounds good, but if you let more traffic through there at a time all it does is move the traffic jam somewhere else. Instead it will start at Hill st. and back up into downtown. It needs to be a huge coordination project, and could be done, and should be demanded. As for your other suggestion, I used to go to work really early and get off really early. Wish I still did! Yes, they should have two turn lanes from springhill to the bridge.